Spot or Meso Needling is an advanced Skin Needling Treatment used to stimulate collagen production and improve the appearance of scars and lines. Spot Needling is easily performed using our medical grade Digital Needling System. The Digital Needling System uses a series of microscopic needles that is controlled by a unique motorized head to provide thousands of precision channels into the dermal layer of skin. These needles cause multiple, tiny micro-punctures in the dermis. These micro-punctures stimulate growth factors in the skin and the post traumatic response produces collagen and elastin- two of the key building blocks of our skin. As the structure of the skin is largely left intact, the skin heals quickly after a treatment, allowing you to resume your normal activities within 48 hours. Skin Needling is suitable for people who want to eliminate and improve the appearance of acne scarring, eliminate visiable signs of aging and rejuvenate your skin. 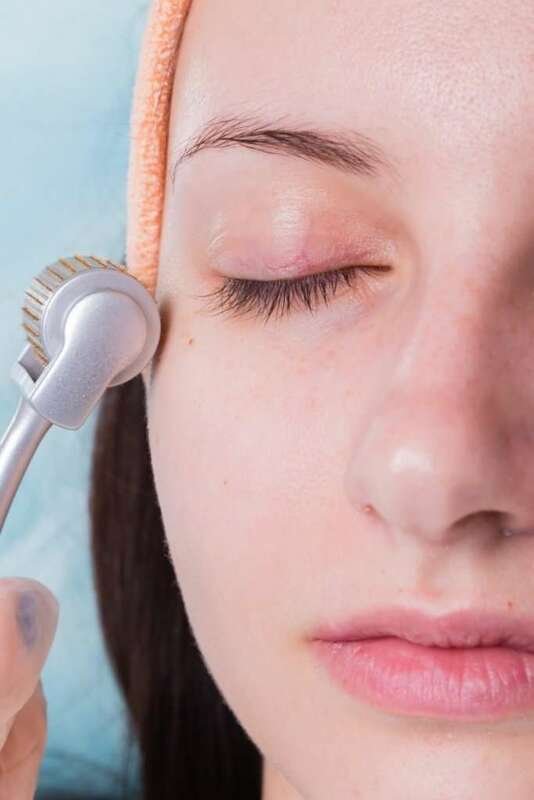 New collagen production is the object of ALL skin resurfacing and rejuvenation treatments helping to eliminate visible signs of ageing and improving the appearance of scarring. Skin Needling is also known as Facial Mesotherapy or Collagen Induction Therapy. It has similar results to Laser, Chemical Peels and Dermabrasion but is far less invasive, which translates to a far lower risk of complications and quick recovery time. Improvement in the appearance of scars and lines is achieved through a series of Skin Needling treatments, spaced 2-3 months apart. Skin Needling and Facial Mesotherapy is most easily performed using a Skin Roller. The Skin Roller causes multiple tiny pin point puncture wounds to the dermis. This dermal damage induces the release of growth factors that stimulate the production of new collagen and elastin. New collagen production is the object of ALL skin resurfacing and rejuvenation treatments. Skin Needling creates dermal damage without the removal of the healthy epidermis, which happens with other resurfacing techniques. Because the epidermis is left intact, the healing period is rapid. The skin does not risk permanent structural damage, sun sensitivity, skin colour loss or hyper-pigmentation. Skin Needling can treat sensitive areas that other treatments have to avoid, such as below the eyes, the neck and the back of hands. Share your details with us so we can share all the good stuff with you.